A full Olympic quad after Sochi, nothing remains irrefutably clean. Off the radar then on again, the Sochi doping scandal has sent recent tremors through the sports world. In a quick summary, after the 2014 Winter Olympics in Sochi, Russia, the host nation was handed sanctions for the 2016 Rio Summer Olympics that affected some of its athletes. A total ban from Rio was not enacted despite the World Anti-Doping Agency (WADA) recommending the contrary. Russian athletes competed under the Russian flag. At the 2018 Winter Olympics in PyeongChang, South Korea, the International Olympic Committee (IOC) handed down a fiercer sanction. 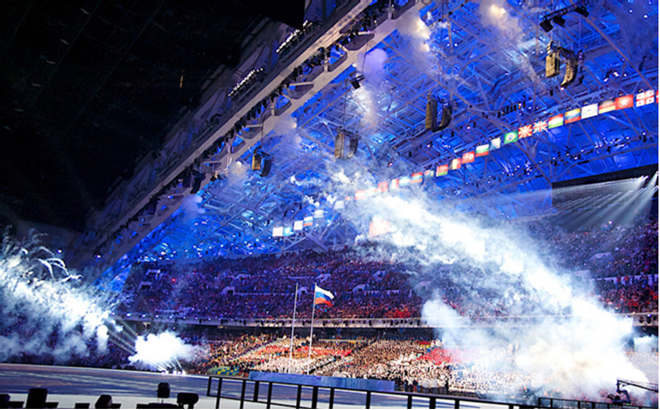 Russia as an official team and its Olympic delegation were banned from the Games, as were athletes suspected of taking part in the Sochi affair. Russian winter athletes without any ties to the scandal competed under the IOC’s neutral flag as the Olympic Athletes from Russia (OAR). At the 2018 Games, OAR cross-country athletes were on-form. They were repeated medalists, fast and collectively young. Today (Thursday, Sept. 20), it was the WADA’s turn to take another stance. During a meeting in Seychelles, the WADA Executive Committee (EC) voted to reinstate the Russian Anti-Doping Agency (RUSADA). WADA announced the decision via Twitter. 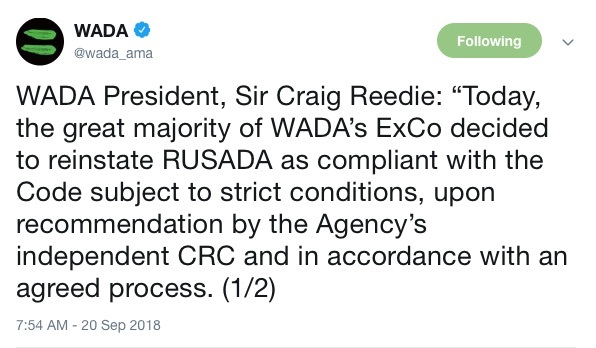 In the two-part tweet, WADA President Sir Craig Reedie stated, “Today, the great majority of WADA’s ExCo decided to reinstate RUSADA as compliant with the Code subject to strict conditions, upon recommendation by the Agency’s independent CRC and in accordance with an agreed process. For reasons already exhaustively documented, RUSADA was deemed non-compliant in November 2015. 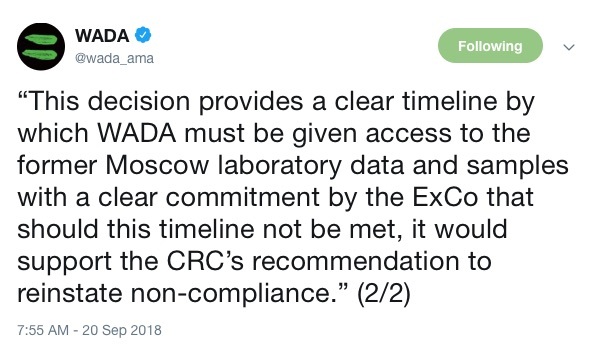 By August 2017, WADA had created a concrete outline of concessions and reforms known as the RUSADA: Roadmap to Compliance. The roadmap reads like a hardened list of demands. In Part I of the document, WADA notes 20 actions already taken by RUSADA as conditions for reinstatement as a compliant anti-doping agency. Part II details 12 steps that remained unfulfilled at the time of the roadmap’s release. Much of those 12 steps begin with the words “RUSADA must”. Last week, it became public that much of WADA’s leadership have a malleable understanding of the word “must”. Two critical conditions set forth in the RUSADA roadmap remained unmet by Russia as of Sept. 20, 2018. Russia has not officially accepted the McLaren Report findings and has not provided WADA with unmanipulated digital forensic data or unfettered access to RUSADA’s Moscow lab. Starting this summer, it was time for WADA and RUSADA to think about a resolution. In a letter obtained by the BBC dated June 22, 2018, signed by Reedie and WADA Director General Olivier Niggli, the two responded to a recent overture from Russian Minister of Sport Pavel Kolobkov. The letter clarified how WADA would be willing to move forward in negotiating Russia’s reinstatement. The main body of Kolobkov’s letter establishes a quid pro quo. It states that only after RUSADA is reinstated, and with the consent of the Russia Investigative Committee, Russia will provide access to its lab and data. Kolobkov provides no timeline for when Russia would provide these two key provisions after reinstatement. On Sept. 14, only a day after Kolobkov’s letter, WADA’s Compliance Review Committee (CRC) approved RUSADA’s reinstatement. A member of the CRC, Beckie Scott, a former Canadian cross-country skier and Olympic gold medalist, resigned her position last week in protest of the pending reinstatement. Scott remains the Chair of WADA’s Athlete Commission. In an interview with the CBC on Thursday following the official decision, Scott said she was “profoundly disappointed”. “I feel that this was an opportunity for WADA as the global body responsible for regulating doping in sport and responsible for the rights of clean athletes has really dealt a devastating blow to clean athletes with this decision and I’m quite dismayed with the way things went today,” she continued. Other notable voices also came forward declaring their dismay with the CRC. WADA Education Committee Chair Edwin Moses penned an op-ed in The New York Times, which was published Sept. 15. The U.S. Olympic Committee (USOC) issued a press release echoing sentiments to instill faith in the anti-doping system. But according to Reedie, Russia’s reinstatement is key to progress WADA’s worldwide mission. One WADA EC member, Linda Helleland, Norway’s sport minister and vice president of WADA as she represents national governments on the EC, declared herself a “no” vote prior to today’s meeting. FasterSkier will update this story with any new developments.